On any given day, depending on what channel you are watching, which podcast you’re listening to, or which way the wind is blowing, you will hear that this economy is up, you will hear it is down, you will hear things are improving, and you will hear we are headed towards a recession. With all this uncertainty, how is anyone supposed to know what to do to successfully run a business, find a job, or keep the position they have? As I listened to the reporters and our politicians take us on the usual rollercoaster, it made me wonder if we, as leaders, were doing to our employees what our political leaders are doing to us? Are we changing our minds as often as we change our shoes? Are we sending so many different messages to our teams that we are creating cultures of uncertainty? Cultures where our employees are guessing at what to expect, what we need, and how best to ensure we all succeed? Now I cannot do much about Washington or the press, but I can help you make sure that their uncertainty does not kill your business. While you cannot guarantee your employees or your customers that change is not going to happen, or that times may not be tough, you can create a culture that gets them comfortable and gives them some control in this new uncertain economy. Be Transparent – your customers and your employees understand these are challenging times, and they are not looking for guarantees, they are looking for honesty. Share with your team what is working with your company, what is not, and what goals you need to meet to ensure you (and they) succeed. Let them know your vision for your company, your values and what priorities you have set. Being transparent with employees about the challenges and opportunities of your company gives them a feeling of understanding, and says volumes about your trust in them. With customers, let them know they are important to your business, and you would welcome their help with new business and referrals. Creating a culture of transparency, with both employees and customers, lays the foundation for trust; a key strategy for getting comfortable with uncertainty. Be Clear – especially in uncertain times your employees want to help you succeed. Unfortunately, they come in with their own understanding and expectations of what you need. Right from the start and on a routine basis you need to be clear, clear about what you need from them, clear about what is important in your company, and clear about how they can truly contribute. Helping people know how best to help gives them a feeling of control in uncertain times, and it empowers them to drive change rather than be driven by it. Be Focused & Flexible – there is so much happening that can impact your business that is outside of your control, and worrying, stressing or talking about it unfortunately accomplishes nothing. At the same time, you need to be prepared to move fast to take advantage of new opportunities or minimize risk. The best way to succeed in uncertain times is to focus while remaining flexible. How is that for confusing? Okay – First take the time to get straight on what your vision is for your business, what goals will get you there, and specific actions you will take to achieve your goals. Then stick to the plan, with one minor adjustment. Every three or four months, get out of your business and your own head, and just ask yourself, what is going on with my customers, my industry, the economy, etc., that could negatively or positively impact my business, and what, if anything, do I need to change? The problem with uncertainty and the pace of change we are experiencing is that it is easy to get derailed or off course. By being focused and flexible, we combine the best of both worlds, and create the only strategy that works in uncertain times. The truth is yes, these are volatile times, and no one actually knows what is going to happen with the economy, consumers, or the global markets. But honestly, have we ever? When in history has anyone been able to do anymore that make an educated guess as to what the economy, our customers or the global markets are going to do? 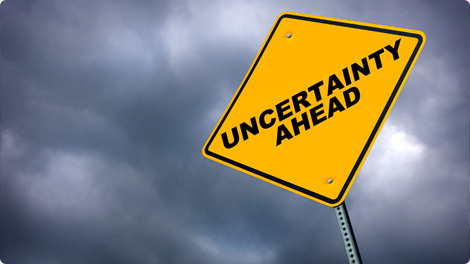 Don’t let uncertainty kill your business! We are, and will continue to be, in a highly shifting economy, but it does not prohibit us from being successful! With solid, clear communication, an intent to remain transparent, and a healthy balance of focus and flexibility, you can continue to make this economy work for you! Guest author Meridith Elliott Powell is an internationally certified coach, consultant, motivational keynote speaker and blogger, who works with clients to help them instill ownership at every level to ensure profits at every turn. She is the author of several books, including the professional’s guide to business and sales success, Winning In The Trust & Value Economy.